Dear Readers, to truly appreciate some plants you need to get down on your hands and knees and really study them. The flowers of red clover are so complicated, so gently unfolding, and so delicately coloured that if they grew at eye level I’m sure we would be more impressed than we are. As I watched this little patch of clover in the cemetery the blooms were continually fumbled by bumblebees, who seemed almost drunk on the nectar. 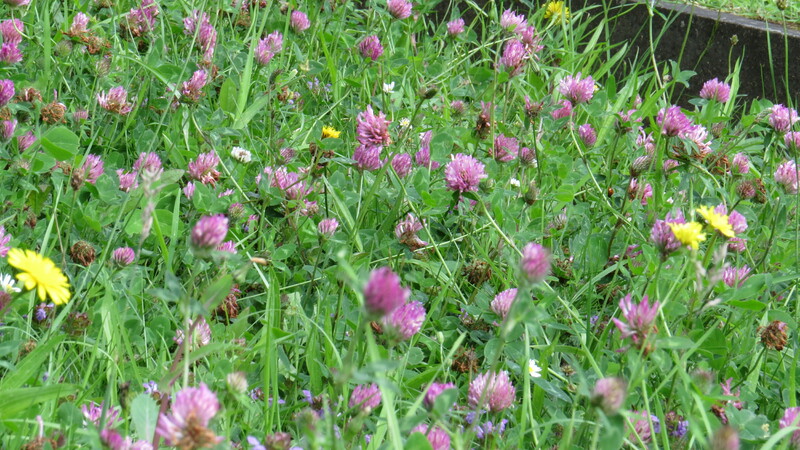 Ah, there are many reasons to love clover of all kinds, but its generosity to pollinators is a long way up the list. And as a child I would sometimes pull the petals from the flowers for the little drop of sweetness at the heart. Nowadays, I’d be a bit more careful about whether the area had been sprayed with biocides. 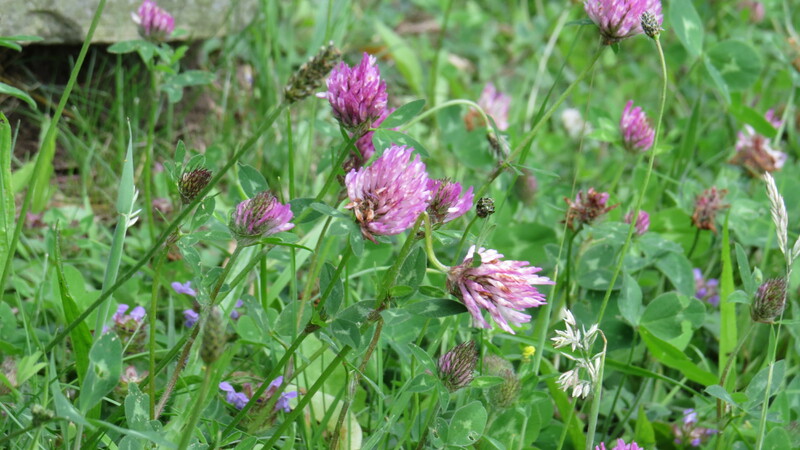 Red clover is native to the whole of the UK, Europe and Western Asia, and has been naturalised in most of the rest of the world. It is a fodder crop, and, as another member of the nitrogen-fixing pea family, it is often used as a green manure. I love the way that the tousle-headed flowers brighten up a wildflower lawn – in the photo above you can see the clover hanging out with blue self-heal and black medick, and it is often a companion to white clover, birds-foot trefoil and many other plants. 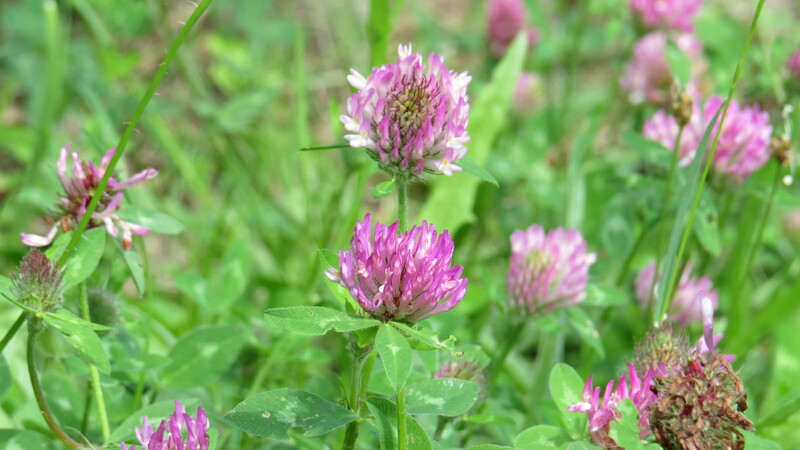 Red clover is said to have a variety of medicinal properties. One, I notice, is as an aid to the symptoms of the menopause. If I’d known this, I’d maybe have collected some from the cemetery as a remedy for my hot flushes. As a young woman, I was completely unprepared for the infernal character of the average hot flush, and the way that they can very effectively destroy that ‘sleeping’ nonsense for four or five years. Fortunately, I am now through the worst (says she, fingers crossed), and am looking forward to the focus and energy that everyone promises me on ‘the other side’ once my oestrogen has been offset by a hearty dose of testosterone. Never underestimate the power of a post-menopausal woman with a bee in her bonnet, that’s what I say. You can make a very pleasant tea from red clover flowers. 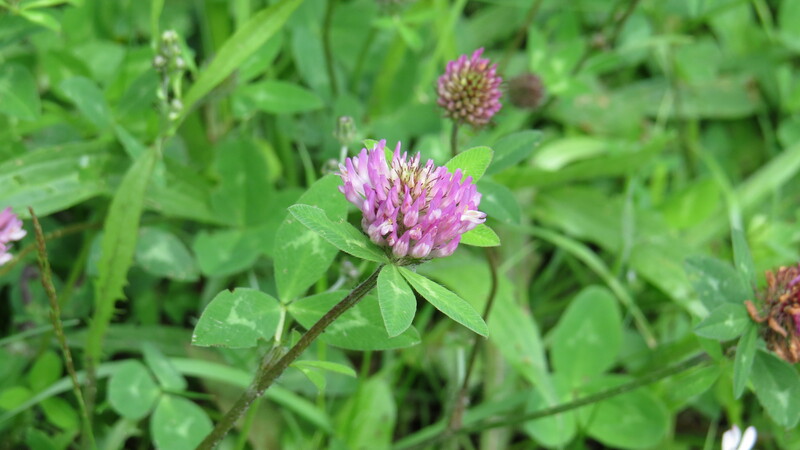 On the Roscommon Acres website, they have gone several steps further and made red clover jelly and red clover wine, though it sounds as if the main benefit is the colour that the blossoms provide rather than the taste. I got rather excited about a cocktail called Red Clover which was on the Absolut Vodka website, but sad to say it contains no red clover at all. On the other hand, red clover lemonade sounds, and looks delicious – have a look at the photos on the Adventuress Heart blog. Just the thing for a summer’s evening. I might even try it myself. To finish, I would like to include this poem by John Clare. A labourer by birth, Clare composed some of the most closely-observed nature poems ever written. He was a troubled man, who suffered from depression, alcoholism and who was several times incarcerated in an asylum. Here is his poem about our Wednesday Weed. The description could have been written yesterday. Down corn-field, striped balks, and pasture-leas. I cut my oaten trumpets by thy side. This entry was posted in London Plants on June 29, 2016 by Bug Woman. 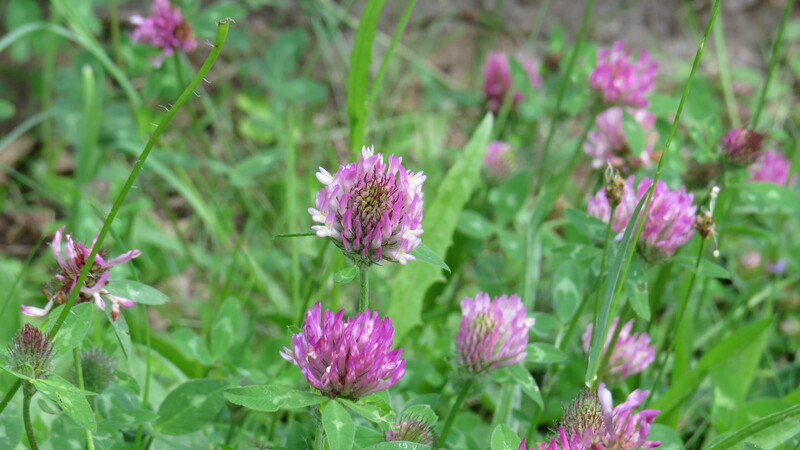 Red clover is one of my favorite plants. If you have a few moments, please take a look at my graphite pencil drawing of red clover on my website marlamazarcarr.com. Fabulous, Marla! I’ve just linked to your website on my Bugwoman Facebook page. Lovely work. I love the way that the pencil brings out the structure of the plant…. I have some in my small wildlife garden that I sowed last year and the bees fall over themselves trying to get at the flowers. Will be introducing some to the budding wildlife meadow under my cider trees at my allotment come autumn. Literally an overlooked plant and so pretty! By the way sage drops are good for hot flushes too!! Thanks Anne. A friend of mine recommended maca root as well. Provided I stay off the chocolate and alcohol I’m not too bad, but who can survive without them in these ‘interesting’ times? I will investigate it thanks! Chocolate and alcohol hmmm interesting! I am currently on antibiotics trying to fight an abscess and have to avoid alcohol while taking them and strangely flushes not as bad…!